Lemons are one of the most beneficial citrus fruits in the world and they abound in minerals and vitamins. However, we shouldn’t neglect its yellow peel that protects its fruit and at the same time offers many health benefits and has many other uses. It helps with cystitis and tumors. 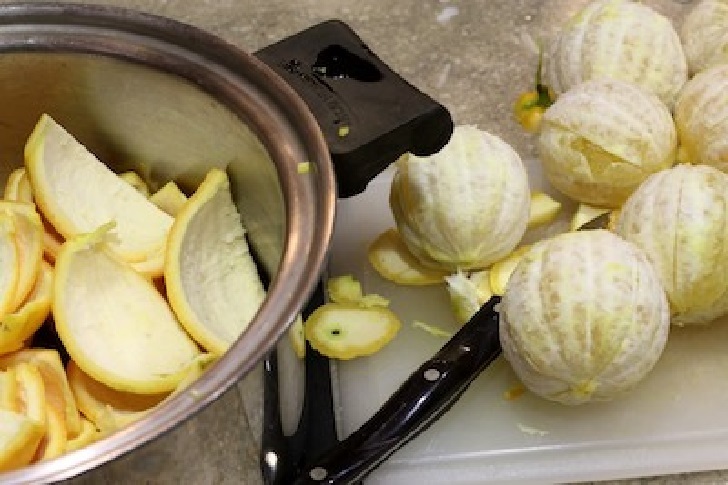 Shred some lemon peel, pour water over it, and then leave it to stay for several minutes. Afterward, squeeze some lemon juice and drink this concoction during the course of a week, every morning, so that you cleanse your body system. Mix some shredded lemon peel together with 1 teaspoon of baking soda and squeeze several drops of lemon juice. Stir the mixture and apply to your elbows and cracked feet after showering. Mix ½ a cup of sugar together with some shredded lemon peel and add 1/8 cup of olive oil to it. Use this mixture on a wet skin, rub it into your skin, and leave it to stay for 10 minutes. After that, rinse with lukewarm water. Lemon peel has antibacterial properties and thus it is ideal for disinfection of kitchen worktops. It is great for cleaning cutting boards. Dip the cutting board in some hot water and then rub it with shredded lemon peel mixed with some lemon juice. Put some shredded lemon peel and water in a ceramic vessel and place it in your microwave oven. Heat it up at to the highest temperature and let the mixture boil for 3 minutes so that its steam removes those stubborn stains and neutralizes the smell. You can remove lime scale buildup from your sink by using a mixture of lemon peel. Place a pot, to which you’ve added lemon peel, 2 tablespoons of baking soda, and 1 tablespoon of apple cider vinegar, on the stove and turn the heat to high. Pour 3 dl of water and leave it to boil. Afterward, strain the mixture and pour it over the surfaces with limescale buildup. Leave it to work for about 10 minutes and then rinse with cold water. You can get rid of insects with the help of lemon peel. Cut several notches into the lemon peel and the ethereal oil that will be released from it will prevent the unwanted guests (insects) from entering your home.